A Meteor Shower Made by Halley’s Comet Peaks Tonight. Here’s How to See It. There are just a few significant meteor showers remaining in 2018. The two most active displays won't arrive until December -- including the Geminids, which is the year's most spectacular display -- so the peak of the Orionid meteor shower this Sunday may be one of your best chances to experience a spectacular night of stargazing before the year is out, even if it's not the most active shower left this year. The Orionid meteor shower runs from October 2 through November 7 and will peak the night of Sunday, October 21 into the morning of Monday, October 22. (Though there should be good viewing the night of October 20 into October 21 as well.) 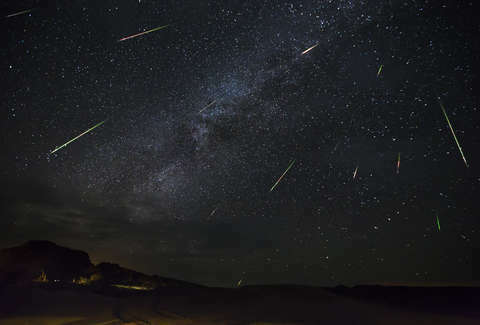 Earlier this year, Bill Cooke of NASA's Meteoroid Environment Office told Thrillist to expect somewhere in the range of 20 to 30 meteors per hour when the Orionids peak. Unfortunately, it looks like some of these meteors will be obscured by the bright light of a nearly full moon on the night of October 21. The shower, which stems from Halley's Comet, has the ability to produce up to 90 meteors per hour in a year when it's at its most active. We won't see that this year, but that doesn't mean you won't be able to see some bright shooting stars when you look up tonight. The best time of night to catch the Orionids will be around 2am local time, per Space.com. Though, if you go out in the pre-dawn hours a little past the exact peak, you may have more luck since the moon will cause less interference earlier in the morning after it sets. You can also find good viewing on October 29, per the report. Though, the display is not still at its peak that night. The Orionids produce the fastest meteors of any meteor shower except for the Leonids in November. "The Orionids, because they're moving so fast, they burn up very quickly," Cooke told Thrillist. "In other words, you blink, you're going to miss them." If you're making the effort to not blink the night of the 21st, get far from the light pollution of urban areas, which will obscure meteors and other celestial objects. The International Dark Sky Association has an app that can help you find a good stargazing spot near your home. You'll also need to be sure the weather is cooperating where you're going to be viewing as well. The meteors will appear to originate from the constellation Orionid the hunter in the eastern sky (more precisely, from the red giant star Betelgeuse over Orion's shoulder). However, you don't want to look directly at the constellation because the meteors will be streaking away from the radiant point. You should be able to see them across a wide swath of the sky, and that's why it's best to lie on the ground or lean back wherever you're sitting and take in as much of the night sky as possible. You may also want to bring some hot coffee or cocoa because it's getting cold, and it can take a while for your eyes to fully adjust to the darkness. The Orionid meteor shower can be seen around the world, but the details here are geared toward viewers in the United States.